The term 'snow storm' encompasses all magnitude of snow fall but is often used to describe a blizzard. A blizzard is a large snow storm with strong winds. Blizzards can be particularly dangerous if heavy snowfall is followed by rapid melting by higher temperatures: this can cause extensive flooding. What Causes A Snow Storm? Snow is formed from condensed water on the atmosphere. Water vapour in clouds condenses to form droplets. Cold air then freezes the water to form ice crystals. As these ice crystals bind with more water vapour they become heavier. Eventually, the ice crystal falls from the cloud, collecting more water vapour as it falls. As the ice crystal descends, and the air temperature increases the ice crystal can melt slightly. This melting can cause crystals to bind together to form larger flakes. Snow will remain on the ground if the temperatures are cold enough to keep it from melting. Snow storms can form in areas with the perfect conditions for snow formation such as air temperatures below freezing and a ground temperature of zero degrees centigrade. North America and Canada experience around 10 blizzards a year, each affecting approximately 2.5 million people. Where Are The Dangers of Snow Storms? Large amounts of snow can affect transport routes, crops and people. 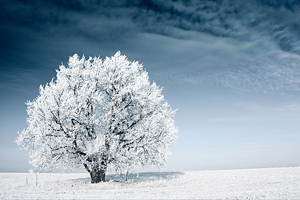 The secondary risks of snowstorms include vehicle accidents, hypothermia, infections from frost bite and possibly fires and carbon monoxide poisoning due to the use of alternate heat sources. In March 1993, an area of low pressure in the Gulf of Mexico moved northwards, intensifying rapidly to form a severe snow storm. It affected 26 states and much of Canada. The cold air, heavy precipitation and hurricane force winds caused widespread blizzards lead to over 300 deaths and a loss of power to over 10 million people. The storm also caused thunderstorms and tornadoes in Florida. This storm caused record levels of snow in Ohio, Pennsylvania, West Virginia and New Jersey. The blizzard moved across Canada into the north-eastern areas of the US, killing more than 154 people. The blizzard was followed by usually warm weather with rain melting the snow cover, creating severe flooding. The floods caused a further 200 fatalities.